An Analemma in Northern Italy. On a recent trip through the less traveled parts of northern Italy (less traveled compared to the crowds encountered in Rome, Florence, and Venice) our traveling party found expected, and surprising, evidence of the great contributions to our modern world made by Italians in the first and second millennia. The evidence is set in stone. 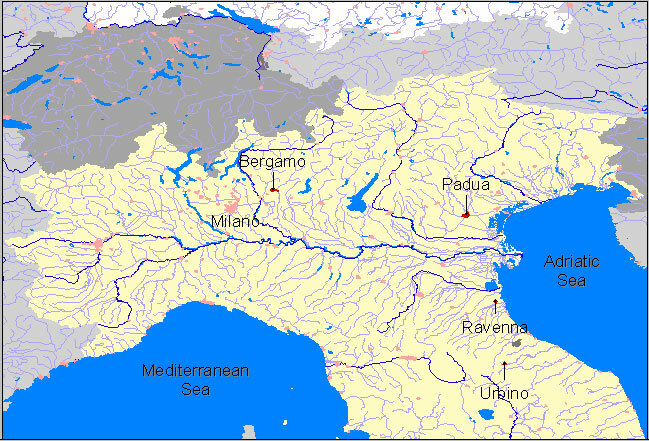 In the fifth and sixth centuries A.D. Ravenna, on the Adriatic Sea, was the seat of authority of the emergent church at the time the division was opening between the eastern and western churches. Evidence of both Byzantine and western Christian traditions are preserved in the beautiful mosaics of the churches, mausoleums, and other religious places in Ravenna. The images, made of stone and colorful glass, have remained bright and clear over time. 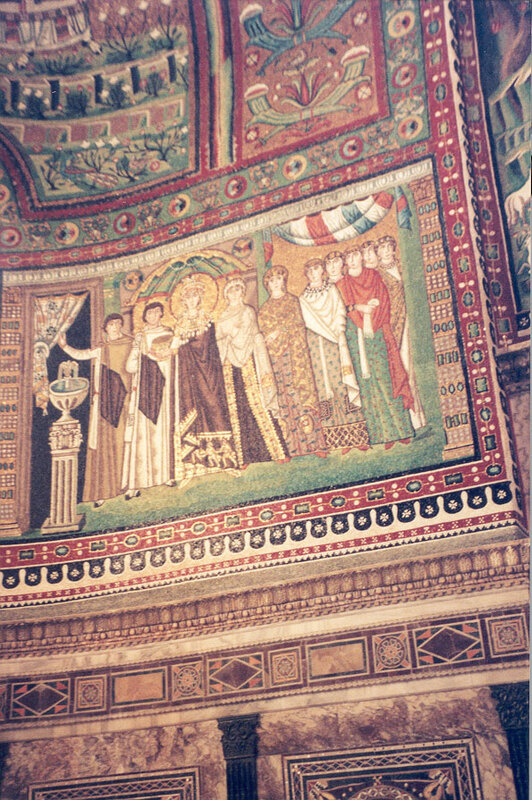 The interior of Basilica di Santo Vitale (6th century) is an example. 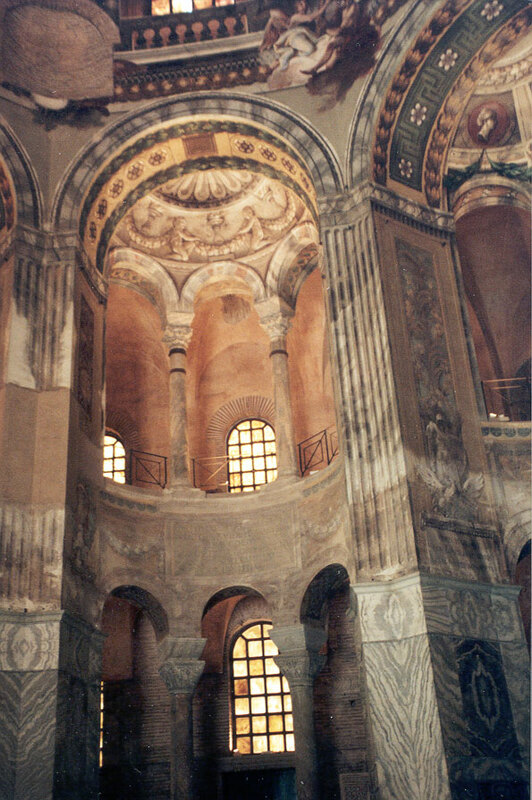 Many mosaics in the basilica cover walls, ceilings, and floors as do others in various religious structures throughout the city. 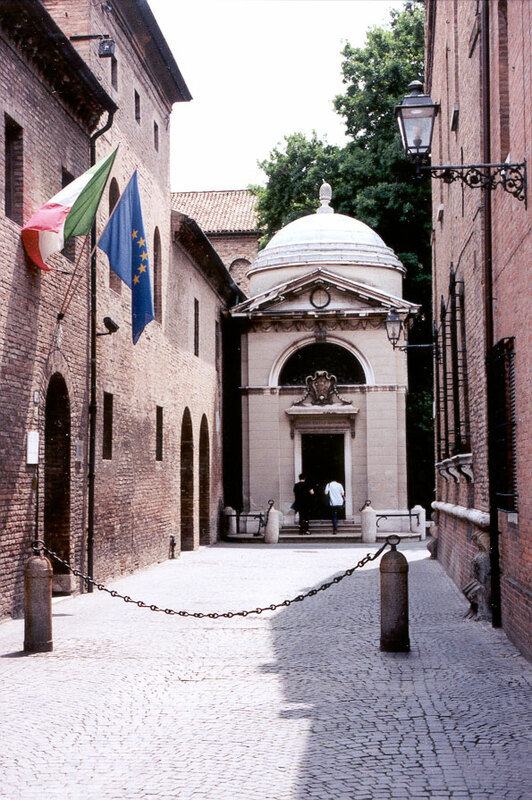 Ravenna has been continuously occupied; it was an intellectual center during the Renaissance. Danteï¿½s tomb next to the old churches is evidence of the importance of the city in the thirteenth and fourteenth centuries (Dante 1265-1321). Urbino is a well-preserved Renaissance town in the mountains to the south of Ravenna. It was prominent in Italian history for two short centuries after which fortunes declined and it was annexed to the Papal States in 1631 and left to languish in obscurity. Its rise to fame was due to Duke Federico di Montefeltro (1444-1482) who was most influential in advancing its political, artistic, and intellectual achievements. 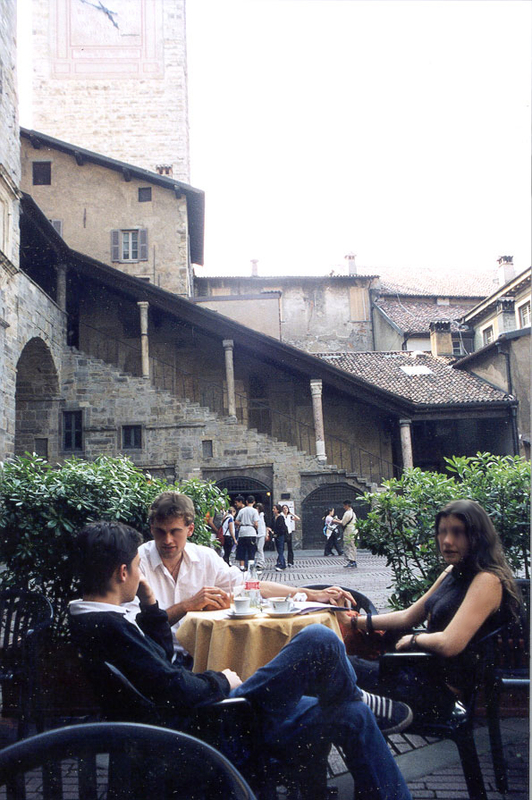 The value of this history to us is that the magnificent Ducal Palace (the linked photo shows its courtyard) and other renaissance buildings in the city were not demolished or scavenged in the process of building new structures suited to subsequent eras. In the decline, the Palace fell into a state of abandonment and many of its art treasures were scattered to Rome, Florence and other seats of power. 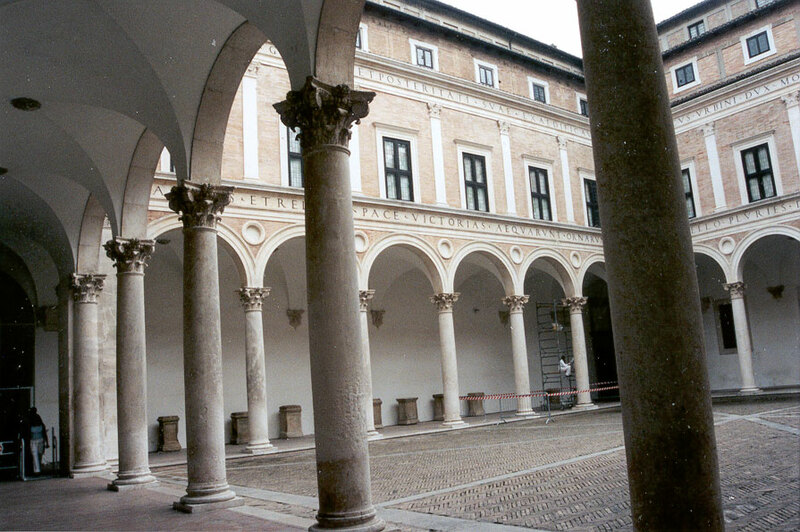 Restoration began in the early part of the 20th century and the Palace is now the National Gallery of the Marche. Also, fortunately, the Palace appears to have escaped the ravages of World War II despite the fact that heavy fighting occurred in the vicinity. Urbino was by-passed by the battles of that conflict. 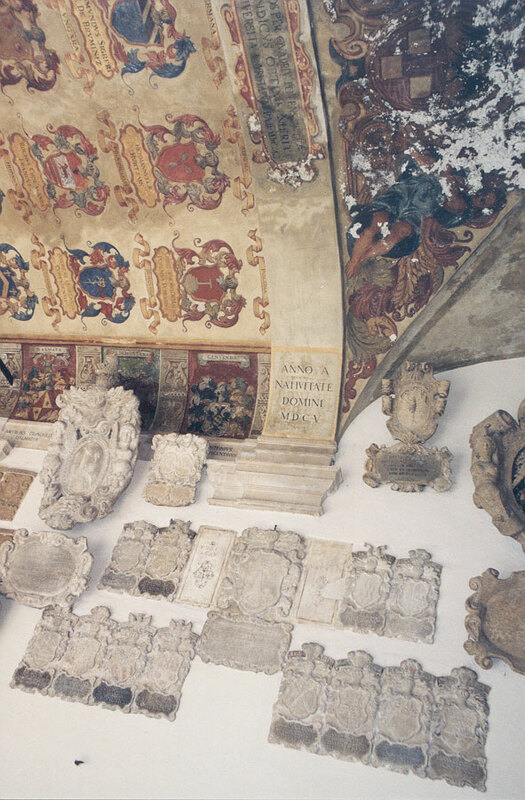 Restoration of the Ducal Palace, along with the new acquisition of Renaissance art, has created a magnificent museum of the Renaissance. Here, within limestone and marble walls more delicate evidence of high civilization can be seen in the paintings, sculptures, and inlaid wooden cabinets and doors. 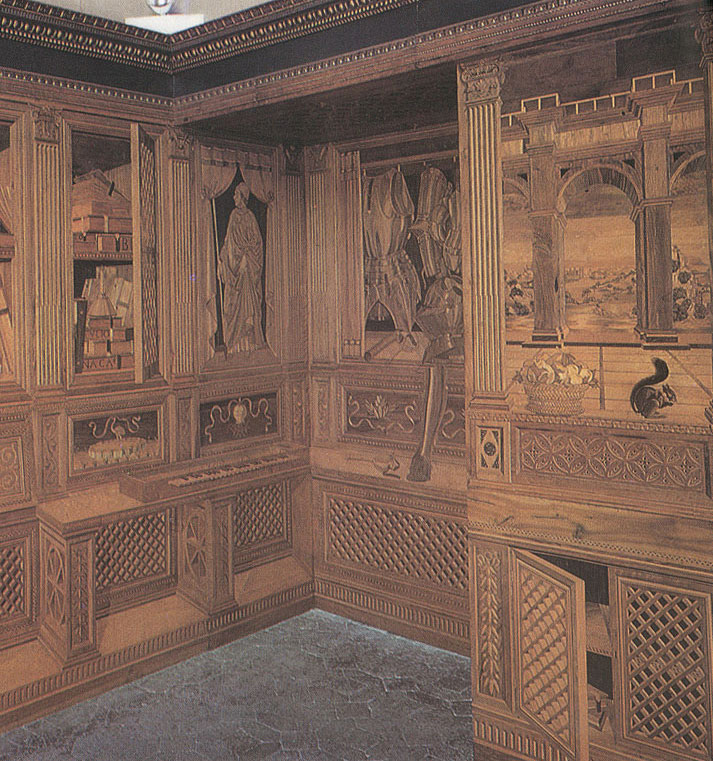 The Duke's study, paneled with inlaid wood, celebrates the discovery of perspective views used by artists to depict, with mathematical precision, three dimensional images on two dimensional surfaces. 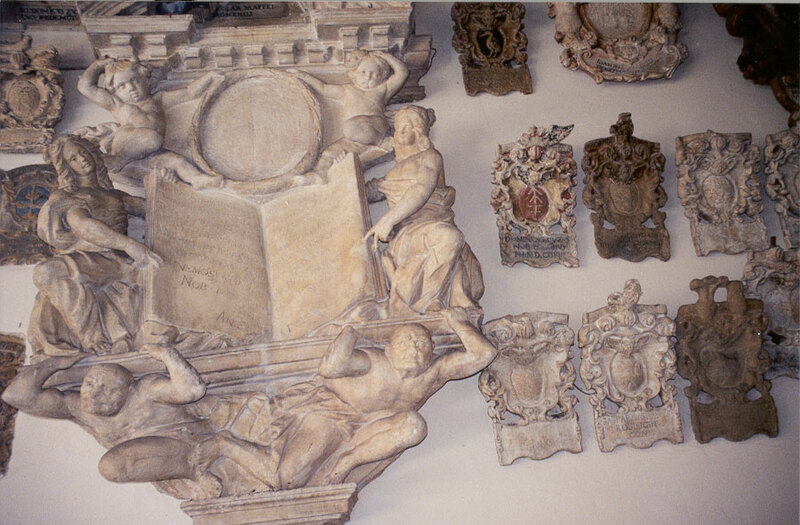 The panels in the Duke's study have several versions of the illusion of three dimensions executed on a flat surface. Padua is another mid-sized Italian city just to the north of Ravenna with architecture and art dating back before the renaissance. It is also the site of some of Galileo's experiments with telescopes and of the first scientific studies of the human body carried out by careful dissection of cadavers. These medical demonstrations took place on the stage of a steep-sided amphitheater located at the University of Padua, one of the oldest universities in Europe, founded in 1222 (Leslie Nystuen, M.D. attempts to enter the amphitheater). The careful, dispassionate demonstrations by professors in front of medical students were meant to impart knowledge to medical students as it was being created through use of the new empirical tradition of science. 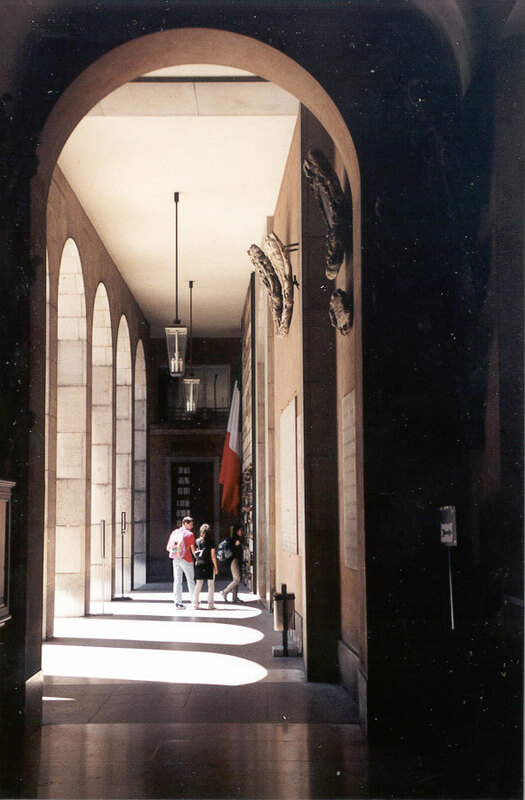 The walls of the loggia enclosing the old courtyard of the Bo Palace, one of the core buildings of the university, are lined with stone seals and crests of graduates of the medical school. Bergamo is a city located at the foot of the Alps northeast of Milan. The city is divided into the old, Alti Calli (high city) located high up steep-sloped hills with the new town spread out across more level surfaces at lower elevations. 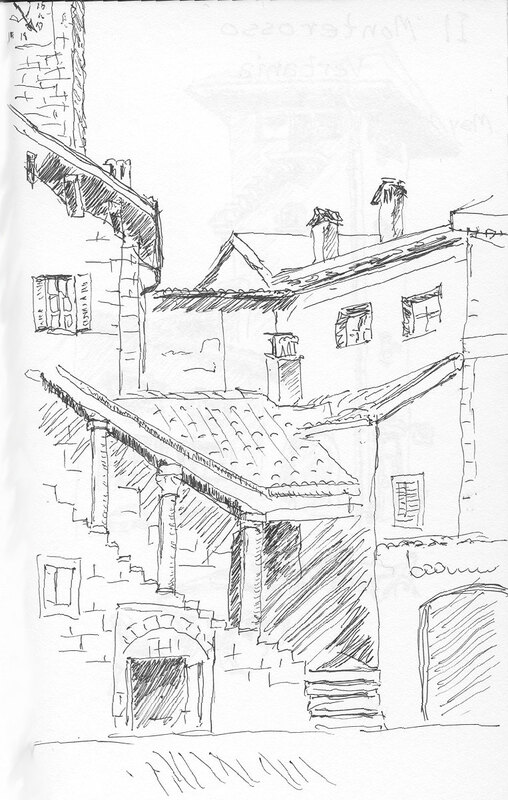 The central piazza might serve as a setting for a Shakespearean play (photo; sketch by author). 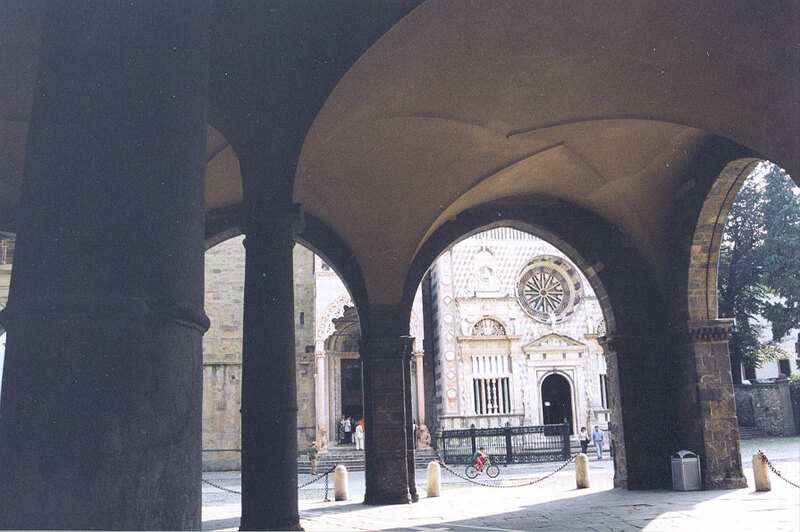 A medieval cathedral and a renaissance church stand close together at one end of the main piazza and are separated from it by an open-sided arcade covered by a high arched and vaulted ceiling. point in the sky and the pencil of sunlight illuminates the crossing of the analemma trace with the meridian on the southern extreme of the smaller of the loops of the figure 8. The light beam crosses the meridian twice more during the year; in the center of the figure 8, once on the Spring Equinox and again on the Fall Equinox but with the pencil of light approaching from opposite directions. On our visit, we immediately recognized the inlaid figure on the floor to be an analemma but we were puzzled because it was located under a roof and surrounded by large buildings. How could direct sunlight fall on it? Close observation revealed that to the south just enough open sky existed to permit the sun to shine through the shield and onto the floor at noon on any day of the year (with a view of the shield in mind, now check back to the broader general picture to see it in context). Analemmas are specific to the latitude at which they are located. 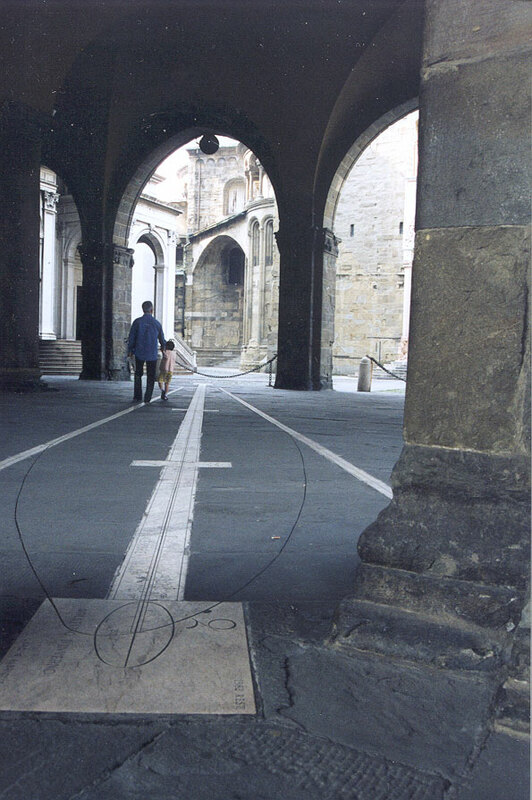 Inscribed in the floor along with the analemma is a record of the latitude, longitude and elevation of the figure. 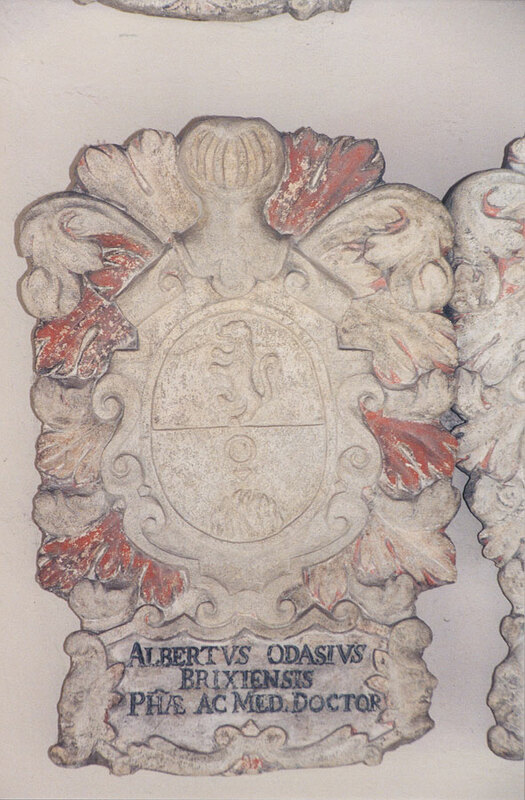 The inscription reads, <ï¿½Latitude 45Â° 12ï¿½ 11ï¿½ Nord, - Longitude 9Â° 39ï¿½ 46ï¿½ Est> and on another line, <Altitudine M 360.85 sul livello Dell Adriatico> . A compass rose is also present to which is affixed the presumed date of the work, 1857. That date is 137 years after telescope-equipped theodolites came into wide use for accurate measurement of angles (1720) (Wilford, p. 97). In that era, more accurate and stable surveying equipment was introduced and used for land surveys and earth measurements. In 1666, Isaac Newton had predicted that the earth might be better modeled as an ellipsoid or oblate spheroid (a solid figure generated by rotating an ellipse around its short, or minor, axis) than as a sphere (Wilford p.99). Using the improved surveying instruments and techniques, the French investigated this hypothesis by undertaking to measure an arc of the earth near the North Pole along the Meridian of Kitts (Lapland) (1736-37) and similarly along the Meridian of Quito (Ecuador) (1735-43) (Wilford, p. 101). The arc nearer the pole proved flatter than the arc at the equator, that is, a degree at high latitudes is longer than a degree near the equator. The curvature of the earth is greater at the equator and flatter near the poles. The technology increasing the precision in the measurement of angles and distances had been put to great scientific purpose, establishing the shape of the earth by empirical means in support of theory. That more precise earth model was needed for the Bergamo analemma to be constructed with sufficient precision of shape and position for the sunbeam to stay on the track laid in stone. 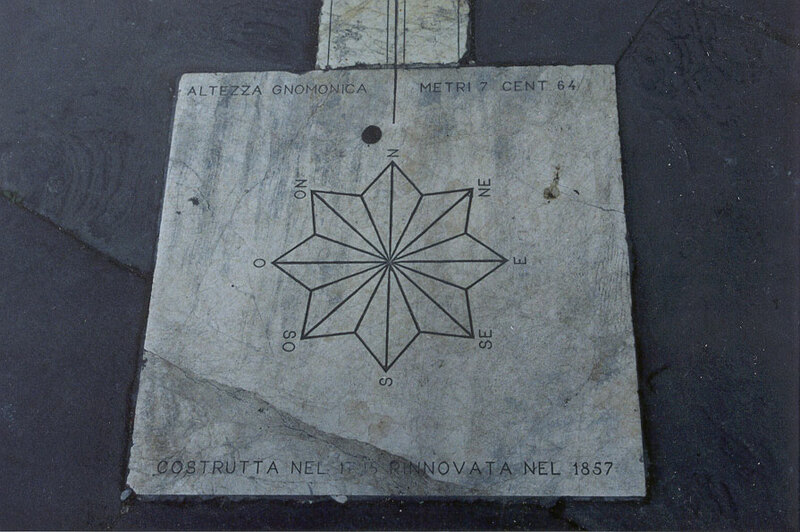 The Italians had undertaken cadastral and topographic surveys of northern Italy by the time the Bergamo analemma was constructed. Knowledge from such surveys would have been used to fix the location and altitude of the analemma. The two decimal figures for altitude implied high order geodetic control. I wonder though whether theory alone was sufficient to predict the placement of the analemma relative to the shield mounted on the wall. It could be closely predicted but I speculate that the theory might have been backed up by empirical observations made throughout the seasons. Theory would direct how the construction should proceed; practice, on sunny days throughout the year, would suggest the location of the beam of light that could then be checked and recorded empirically. This presumes that they could determine the moment that high noon occurred. Over the months the precise path of the spot of light could be traced out. 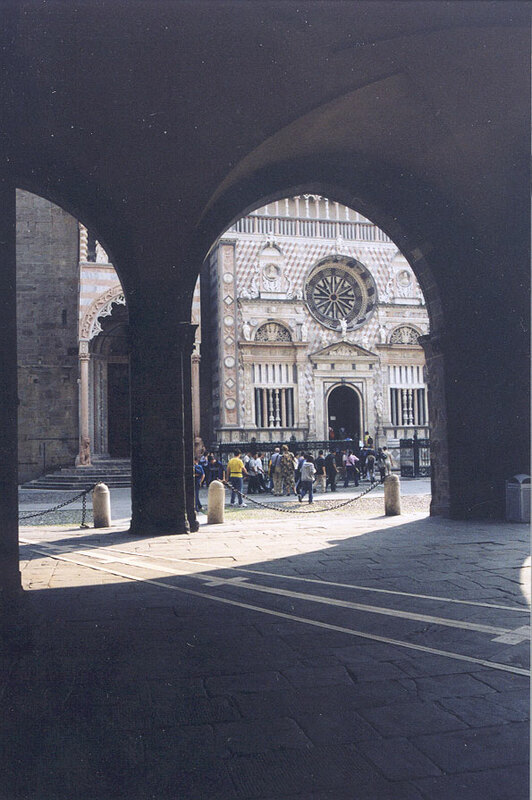 Our overnight (May 15) visit to Bergamo was too short for us to learn of the history of the construction. A large library located on the piazza no doubt has a record of the project and perhaps on another day we will return and look into it. We were able to conduct some empirical observations of our own. Jeffrey Nystuen, one of our party, had a portable GPS (global positioning system) receiver. The instrument was a hand held Magellan GPS receiver that he named Enrico, after Henry the Navigator (1394-1460). Despite being under cover with little open sky visible, Enrico could fix the location and altitude of the analemma. The receiver recorded the same latitude to the exact second as that written in the stone. There was one-second difference in longitude. Enrico reported elevation as five meters higher than that recorded in stone. Fixing elevation with a GPS is less exact than fixing position. In May of 2000, the Selective Availability feature of the GPS was turned off by the U.S. government. Prior to this date, for military purposes, deliberate degrading of the stability of the on-board atomic clocks in the GPS satellites degraded the GPS signals. The Standard Positioning Service that had been previously available (worldwide) provided at best 100 meter accuracy. As it was, this degradation could by overcome by using differential GPS procedures in which a base receiver station with a well-known position could be used in conjunction with a roving receiver. This procedure was being routinely applied by a variety of civilian users. Today relatively inexpensive GPS receivers are being employed in myriad tasks not at all envisioned by the designers of the system. 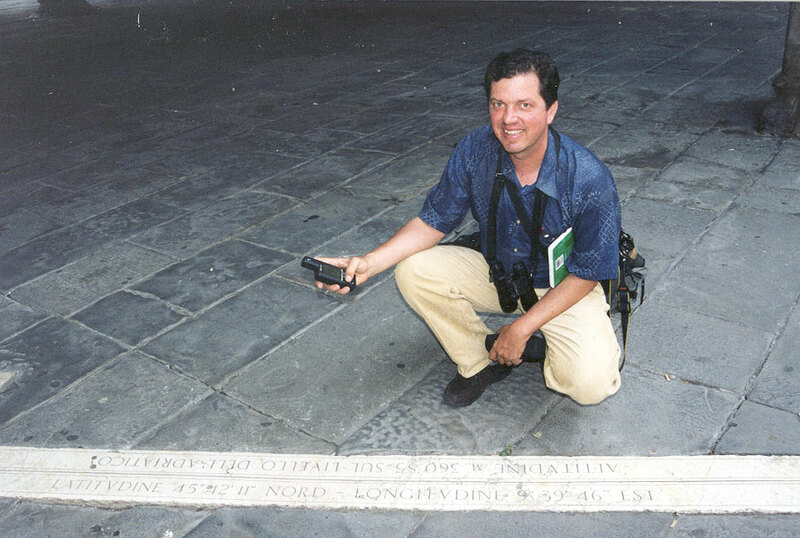 For example Enrico, the hand-held receiver, provides the basic latitude, longitude, and altitude with error terms attached but it can also indicate direction and speed of movement -- even walking speed. One can fix a position in Enrico's memory, such as the location of the parked car, and then wander off through a maze of medieval Italian streets and Enrico can show the path to take to return to the car. It has in its memory the locations of most towns and cities with population greater than twenty thousand, at least, in North America and Europe where Enrico has been put to use. Precise agreement in latitude and one second discrepancy in longitude seems very good for the performance of a hand-held GPS receiver and for the older methods that were employed to locate and design the analemma. Yet given the assumed accuracies, a 22 meter discrepancy may be too large. The likely explanation is in the differences in the theories applied. The Italians in 1858 modeled the earth as an ellipsoid using the best available datum (values for earth radii and eccentricity) perhaps the Bessel, 1841 model that is widely used in Europe. This datum differs from WGS84 (World Geodetic System, 1984) which now is used in conjunction with modeling the satellite orbits. Those orbits respond to the earth's center of gravity, not its geometric center. The same basic assumption must be made to achieve identical results. What the good correspondence we observed indicates is that both models are very good. The Italians have made many contributions to Western Civilization and to our modern global society. Fortunately records of some of these achievements have been set in stone. I wonder, in this new informational age that we live in today and that is so rapidly becoming digital and electronic, are we leaving imprinted forms so durable that after one hundred fifty years, a thousand years, or fifteen hundred years they will be fresh and bright, full of grace and beauty and intellectual achievement? Will they charm passing travelers? Alfred Leick, 1990 GPS Satellite Surveying. New York: John Wiley & Sons, Inc.
John Noble Wilford, 1981 The Mapmakers, New York: Alfred A. Knopf, Inc. 1981. Arthur H. Robinson, Joel L. Morrison, Philip C. Muercke, A. Jon Kimerling, Stephen C. Guptill, 1995 Elements of Cartography, sixth edition. New York: John Wiley & Sons, Inc.
By my calculations, on May 16, 2000, with the summer solstice fast approaching, the sun should have been directly overhead at noon roughly somewhere near where I stood in south Goa. The linked photograph shows the authorï¿½s wife, Kami Pothukuchi, on the beach in Goa, approximately 74 degrees east longitude, 15 degrees north latitude. Consider the pattern of shadow in that photograph. Prior to this past May, I had never experienced the sun directly overhead, nor had I traveled to India, my wifeï¿½s home country. Thus, during my stay in India, I could not help but contemplate the sun and its byproducts and how they affected life in India. Indirect products of the sun, too, were much in evidence during this trip. Fossil-fuel powered vehicles (note traffic in linked photo) are becoming increasingly common in India, for example, and they have begun to cause severe pollution effects. Even in the hill station resort of Ooty, surrounded by tea plantations, diesel exhaust proved omnipresent. Like Mexico City, Ooty is nestled in a mountain valley. Therefore, the exhaust produced by the countless tour buses, motor scooters, and power boats that ply the narrow mountain roads and mountain lakes settles in and stays the night, just like the tourists. Indeed, by my nasal meter, air quality in Ooty was worse than what we encountered in Mumbai. Plastics, too, the polymerized end-products of eons of photosynthetic activity, have found their way into the Indian environment. Everywhere we went plastic bags and bottles littered the countryside. Apparently, the Indian system of creative reuse and recycling of all waste products has yet to devise a system for keeping up with the supply of discarded plastic. Letï¿½s not forget about the rain. The monsoons, terrific storms powered by the intense summer sun heating the land far in excess of the sea, were due shortly after our scheduled departure for the U.S. As luck would have it, however, our return to Mumbai from greeting the sun in Goa was met with the worst pre-monsoon rains in 50 yearsï¿½rains so intense that they shut-down the trains and buses and even dislodged a seemingly endless series of stories dedicated to gambling scandals in cricket and the Miss Universe Pageant (an Indian won yet againï¿½could the sun have played a role here, too?) from the front page of The Times of India. Today (summer solstice, June 21, 2000), the sun begins heading south again, headed toward the Tropic of Capricorn for about the ten billionth time. As it does so, it will pass over much of a nation that is increasingly a leader in high technology, albeit while still having most of its one billion people mired in deep poverty. Now that I am back in the US, avoiding use of my car and recycling all of my plastic, I am hopeful that India will devote some of its newfound high-tech expertise toward improved use of our shared solar resources. Perhaps, for example, an Indian engineer will develop a solar-powered car, or at least one that runs cleanly off all those empty plastic water bottles that I left behind. Source of sand image: cropped from the author's photograph of a beach in southern Goa. Animaps III: Color Straws, Color Voxels, and Color Ramps. To any watch they keep." Robert Frost, Neither out far nor in deep. Animated maps offer exciting possibilities for tracking spatial change over time. In earlier work in this journal (see links above), animated maps (or "animaps") were used to track changes, across the globe, in bee mite population over time. They were also used as analytic tools that could employ surrogate variables to mimic change over time in variables that were difficult to learn about. The introduction of time, through animation, into the mapping process allows the user to participate "with" the map in more than a purely passive manner; two examples are offered below that allow the reader some degree of interaction with the process. In the first, the reader experiences emotional involvement only and a downloadable interaction, only; in the second the reader can actually drag elements of the map around on the screen, as an instantaneous interaction achieved directly through the browser. Maps showing mountain ranges are often some of the most difficult to read. Tightly spaced contours look like a jumble of spaghetti that communicate effectively only at quite a local scale. The broad picture can be difficult to grasp. Consider the following sequence of maps of the India/Nepal/China region surrounding Mount Everest. Here the Himalayas come right up against the Gangetic Plain; tightly spaced contours give way sharply to no contours at all. All the maps in the table below are made from files from the Digital Chart of the World. The contour interval is 1000 feet. The red dot on the map was placed there at 28 degrees north latitude and 86.95 degrees east longitude, the coordinates of Mount Everest given in Goode's World Atlas. That dot appears in all images in this section. The only layers used in this map are those for contours from 1000 to 26000 feet along with the country boundary file. Note the vertical separation line between tiles and the gaps in contours at higher elevations. These suggest a lack of information. When the layer for glaciers is added some of the missing information is added. When the layer for perennial streams is added the remaining missing information is not filled in. Extra information and extra clutter are added. Taking a closer look (1:2,500,000) one can separate some of the contours; others still are clumped. Taking an even closer look (1:1,000,000) permits visual separation of all contours but at the expense of any broad view of the mountain range. TIN based on the contours; the gaps in the contours appear as unusually steep slopes in the associated TIN (as at the right of the map). Glacier pattern covers some of the contour gaps and unusually steep slopes. Streams added to the TIN cover it up a bit too much at this scale. A closer view shows streams filling swales, as one might expect. In an even closer view some of the finer triangular facets forming the TIN become evident. At a broad scale these have the advantage of offering some order where little was discernible with contours alone or with contours and other layers. To get both Frost's close-up and far-out view--to look both out far and in deep--animate the TINs. The animation above is formed from a sequence of 100 TINs of this region. The single images range in scale from 1:5,000,000 to 1:100,000 with images captured at intervals of 100,000 change in the scale. There are 50 images in the landing on Mount Everest sequence and 50 images in blasting off from Mount Everest sequence. The red dot is fixed; it appears to move because, with scale change, the glacier background pattern is changing size and the pattern within it is changing position in relation to the fixed red dot. In previous animaps, change was displayed on a base map. 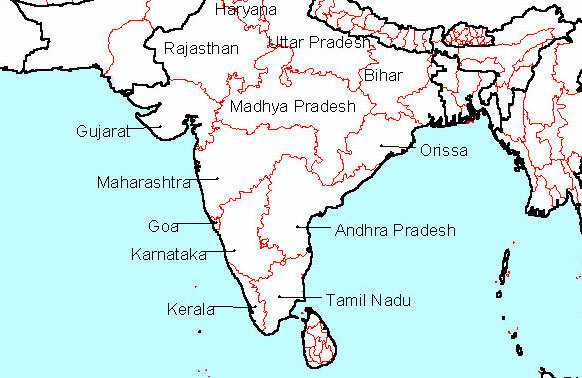 Thus, clustering of regions on the map became apparent over a number of time periods. What did not become apparent was clustering of events in time. Such clustering can be important if one is looking for ways to intervene in the diffusion process; choke-points provide an opportunity to introduce innovations that can control or enhance the diffusion process. A relatively new graphical device, a Java applet (Java is a trademark of Sun Microsystems), offers an exciting way to display change over time and reveals clusters of information in a graphically dynamic manner, much as one might imagine in watching the accelerated growth pattern of grape clusters on a vine. Thus, the "Mapplet" below offers a different perspective on the varroa mite data set. That data set shows easily that there is one country reporting the mite in 1904; in 1912 there is a siting in one other country. This sort of sporadic siting, one country at a time, occurs until 1963. Post-1963 there are multiple countries that come in on a yearly basis: sometimes 3 new additions, sometimes 7 new additions. The pattern of new receptors may show cycles; indeed, experts on the mites might reflect on whether or not the graphical pattern on number of new countries by year corresponds in any way to various biological cycles associated with the mite or its host. If it does, then choke-points in the pattern offer possible timing opportunities to intervene (Arlinghaus and Nystuen). If it does not, then one might consider the extent to which there is cyclical pattern in reporting error or in shipping (http://www.agric.wa.gov.au:7000/ento/bee.htm)and travel patterns. A glance at the maps suggests that those who live in as yet unaffected regions might find such observations of particular interest. In the Mapplet below, the pattern of reported sitings from multiple national sources starts just after 1963: hence, the red color of 1963, as the pattern initiator. The next siting of the mites occurred in 1967, in four different countries: hence the entries of 67a, 67b, 67c, and 67d. In 1968 there were also four sitings; thus, another four boxes, 68a, 68b, 68c, 68d. The 1963 box is joined to each of 67a, 67b, 67c, and 67d using a length of line segment four times as long as the lengths from each of 67a, 67b, 67c, and 67d to each of 68a, 68b, 68c, and 68d. Variation in time between sitings is represented by varying the length of line joining them. All sitings in year X are joined to all sitings in year X+1 (or the next year in which sitings occurred). The rationale for joining all from one year to all in the next year is that one does not know how the diffusion is taking place. What is interesting here, perhaps, is that even when there are years with relatively large numbers of countries reporting sitings, still the pattern settles back to a small number eventually even though one might expect it simply to spread even more. Two obvious directions to interpret this involve reporting error or some sort of saturation of the diffusion, perhaps related to forces such as human travel patterns or mite biology, that are outside the simple mechanics of diffusion (Hagerstrand). The Mapplet can suggest directions for research questions. Mapplet: Structural model of varroa mite diffusion through time. Pull the red year-box for 1963 all the way across to the right (use the scroll bar) and then drag and drop various pieces of the left side of the mapplet to unravel it and see the pattern of possible time points of opportunity at various stages in the diffusion process. If a box "sticks" on another, pull it in a bit of a different direction. Generally it is possible to move beyond the obstacle. Mapplets seem to offer a wide array of possibilities for description, interpretation, and analysis of complex spatial systems. Arlinghaus, Sandra L.; Drake, William D.; and, Nystuen, John D. with data and other input from: Laug, Audra; Oswalt, Kris S.; and, Sammataro, Diana. Animaps.Solstice: An Electronic Journal of Geography and Mathematics. Volume IX, Number 1, 1998. Institute of Mathematical Geography. Arlinghaus, Sandra Lach. Animaps, II. Solstice: An Electronic Journal of Geography and Mathematics. Volume IX, Number 2, 1998. Institute of Mathematical Geography. Arlinghaus, Sandra L. and Arlinghaus, William C. Animaps III: Color Straws, Color Voxels, and Color Ramps, Solstice: An Electronic Journal of Geography and Mathematics, Volume X, No. 1, Summer 1999, Institute of Mathematical Geography. Arlinghaus, Sandra L., and Nystuen, John D. "A cartographic perspective on the security of an urban water supply network," Perspectives in Biology and Medicine, University of Chicago Press; Vol. 32, No. 1, Autumn, 1988; pp. 91-102. Digital Chart of the World, 1993. Strategic Mapping. Environmental Systems Research Institute (ESRI), ArcView 3.2; ArcView Spatial Analyst Extension; ArcView 3D Analyst Extension. Hagerstrand, Torsten. Innovation Diffusion as a Spatial Process. University of Chicago Press, 1967. Liang, Y. Daniel. Introduction to Java Programming, Second Edition. Indianapolis: Que Education and Training, 1999. Arundhati Roy, The Cost of Living, Modern Library, 1999, 126 pp., $11.95 (pap.). During a recent trip to India, my first, I was struck by the imposition of technology into the culture, despite the widespread poverty. Everywhere one turned, billboards touted the latest dot com or advertised training in C++ or Perl. Inevitably, however, below the billboards one would find sidewalk dwellers or streethawkers, none of whom could ever fancy a computer purchase. The newspapers, too, were awash in high-tech advertisements (and cricket scandals and beauty pageants), while news about the majority of Indians impoverished and free of computers was nearly non-existent. Clearly, the papers reflected the lives of the middle class. What of everyone else? In The Cost of Living, Arundhati Roy raises her voice on behalf of those who pay the price for the advancement of others. In this slim volume, Roy brings together two controversial essays that were previously published in general interest magazines (Outlook and Frontline). In these essays, the Booker-Prize winning author of The God of Small Things directs her considerable written skills against two sacred cows of Indian governmental policy: dams and nuclear weapons. Both essays are polemics; yet, they raise important issues and deserve serious attention from activists, policymakers, and scholars. Although written by the same author, the two essays in the volume may appear at first glance to be otherwise unrelated. Upon exploring the book, however, at least two unifying themes emerge. First, both essays raise serious concerns about human efforts to employ technologies that, whatever their perceived benefits, threaten human and natural systems on a large scale. In Roy's view, both large dams and nuclear bombs put human society at war with the natural environment. Second, these essays discuss the often-unexamined costs of technological development and find that not only do all segments of society not benefit from technology, but also that many pay dearly for what is achieved. Third, both ask fundamental questions about democracy, patriotism, and citizenship. The first essay in the book ('For the Greater Common Good') makes an impassioned plea against completion of the Sardar Sarovar Dam on the Narmada River. This river, the fifth longest in India, traverses portions of Madhya Pradesh and Maharashtra before winding through the drought-prone state of Gujarat for most of its course. Originally planned in the time of Nehru, and backed by an international coalition of development interests (the World Bank, Western consultants, Japanese contractors, Indian politicians, and so forth), the Sardar Sarovar Dam threatens the homes of some 40,000 families. Opposed by environmentalists in India and abroad just this month (June 2000) a protest of the dam is scheduled for New York City as well as local activists among the affected residents, the dam, partially constructed and way over projected costs, appears to the author as an epic battle for the soul of the nation. Will India be a nation that cares about the state of its natural environment and the welfare of its least privileged citizens or not? 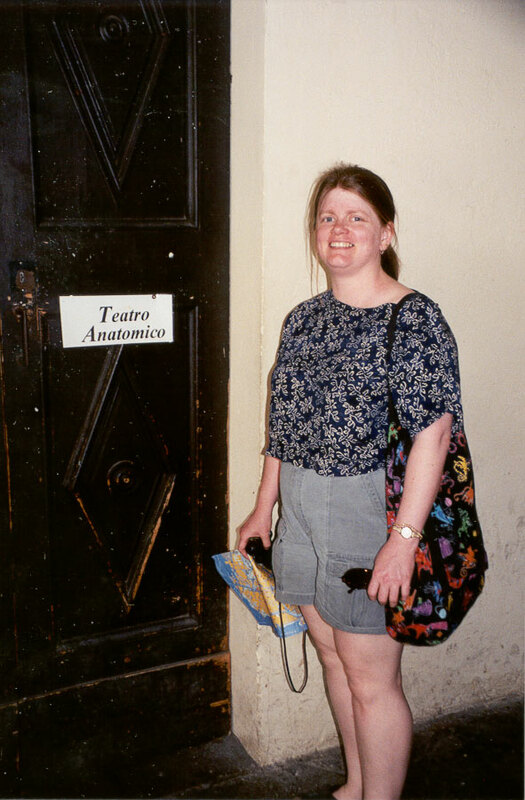 Trained as an architect, Roy brings more than the novelist's skill as a wordsmith to her task. Rather, she meticulously analyzes the promises made by dam proponents and finds their claims of benefits (irrigation, drinking water, and others) to lack credibility. For example, she finds past Indian dam projects have quickly led to waterlogged soil and soil salinization. Second, she details a cycle of debt-creation imposed on developing nations by large projects funded by foreign loans. Third, she examines government plans for Project Affected Persons (the government's official term for those living in the area that will be flooded by the dam) many of them Adivasis, the original inhabitants of India, most of whom live in dire poverty and finds these plans inadequate. Worst of all, she finds that non-landowners, including many of the Adivasis, are scheduled to receive no compensation at all for being displaced. All told, she questions the scientific economic, environmental, and moral bases of the project. By extension, she raises serious doubts about the efficacy and equity of all large dam projects, be they in the developing world or elsewhere. Whether you love the dam or hate it, whether you want it or you don't, it is in the fitness of things that you understand the price that's being paid for it. That you have the courage to watch while the dues are cleared and the books are squared. The second, and briefer, essay in the book, 'The End of Imagination,' presents a voice of dissent against the general domestic jubilation that accompanied India's first successful nuclear bomb test. In so doing, Roy questions the validity of the theory of deterrence and laments the loss of the moral high ground that building bombs implies. In her words, a better position would have been: "we have the technology, we can make bombs if we want to, but we won't. We don't believe in them." For good measure, she also takes a shot at fundamentalism of all flavors and questions popular portrayals of what it means to be an authentic Indian. In sum, this essay makes a case for nuclear non-proliferation for India regardless of what other nations are doing. The bomb itself, and its potential destruction, she argues, is sufficient reason for not building any. Together, the two essays in The Cost of Living present a significant challenge to new and old democracies alike. Is it enough to argue for the greater common good, when the same group of people is asked to pay the costs over and over? Can democracy truly be maintained in a nuclear weapons state? Such questions have yet to be answered anywhere definitively. If nothing else, The Cost of Living invites all to enter the debate.